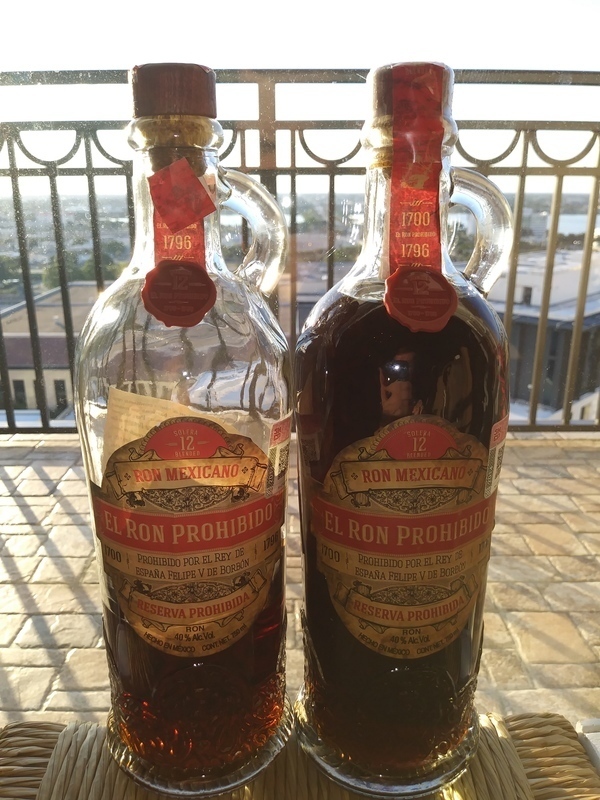 Have you found an online vendor selling El Ron Prohibido 12-Year? Found the El Ron Prohibido 12 year old Solera aged rum from a local grocery store in Mexico last week and had my doubts when I bought the bottle. This is easily the cheapest 12 year Solera aged rum at 214 MXN which equates to roughly $12. It has a harsh alcohol smell to it,but the taste is not so offputting. Mixes well with Coke, goes as a neat sipper in distress. Wood flavor is very strong. Some burn, but not bad. The Rum used to be served to sailors in Mexico, but they all got so hammered that the captains made it illegal to serve! 'El prohibido' the forbidden RUM. The taste is interesting, but nothing to my liking at all. Not very well balanced and simply too 'much'. The rum aged in red wind barrels doesn't taste bad. But it's odd...and in the end it's a combination that is fun to taste but it's not suitable to sip the entire nicht. Fruity first nose which turn into a walnut smell after 10min. Warm in mouth, nice on the tip of the tongue. Bend towards a sweet port wine, not a very good one. Short tail, candied fruits. Nuts again. Not really good. Un rum mexicano, con receta cubana, cuentan una historia de cómo el rey Felipe V lo prohibió. Su presentación es una muy elegante botella. De sabor único ya que es un "Habanero" de sabor suave y dulce. Taste is not fine... Maybe for use in a cake or raisins, not for drinking. Var til Rom og Whisky messen, og smagte denne Rom. Jeg måtte opgive at drikke den færdig, den smagte simpelthen forfærdeligt. Rhum fort en bouche. Note prononcée de fruit sec et de caramel avec un soupçon de vanille. Μου φαίνεται ότι πολύ αυστηροί είστε κάποιοι εδώ μέσα ..... Ο μέσος όρος (5,1) δεν αντικατοπτρίζει την πραγματική ποιότητα αυτού του ρουμιού. Ήμουνα ανάμεσα σε 7 με 8. παίρνει λοιπόν το 8 δικαιωματικά για να ανεβεί λίγο ο μέσος όρος του. Πρώτα το αγόρασα ( με εντυπωσίασε το μπουκάλι και το γεγονός ότι δεν το είχα δει πουθενά άλλου, σε κάβα ή μπαρ) και μετά μπήκα στο site να δω βαθμολογία και κριτικές. Στην αρχή ψάρωσα και νόμιζα ότι έκανα μαλακία που το αγόρασα. Όταν το δοκίμασα όμως κατάλαβα ότι πρόκειται για ένα αρκετά καλό και ιδιαίτερο ρούμι , χωρίς όμως να έχει μακρυά επίγευση. Στα αρνητικά του και η σχετικά υψηλή τιμή φιάλης (30€). I'll be never a fan of this rum, strong alcoholic taste. Sin duda el mejor ron hecho en México lo recomiendo ampliamente, ron dulce oscuro. When I get a new Rum , I get my rum drinking buddy's together and we set down with the new rum and a standard to judge from. This rum has a bite and is bitter. It has overtones of eather and tast like some bad moonshine I have tasted. Everyone in the group dumped it out. Don't waste your money on this one. With the word "Habanero" on the bottle you get certain expectations. There is a spicy taste to this rum, but nothing like the word suggests. Taste: It is very sweet with a hint of prunes and suddenly there is a odd spicy taste, that I can´t really describe. Overall: This was just disappointing. Had high hopes for this one, but it really lacks a clear flavour profile. Lekker rummetje. Gewoon puur. Niet mixen, tenminste niet geprobeerd. Smelled caramel when opening the bottle, though the taste wasn't very sweet. I'm not sure how to describe the taste, simply didn't like it. I would say it wasn't refined enough. Like many Mexican rums I've tried, I found this to be a little 'rough' tasting. Smells and tastes of walnut, raisins, oak, pepper, and spice. Somewhat bitter. This is one of my least favorite from Mexico. This rum is not sweet. No caramel taste nor is it oaky. It masters only bitterness which is hardly diminished with soda..